The FAA can't shut down the National Airspace System to test new technology. The Federal Aviation Administration can't shut down the National Airspace System (NAS) to test new technology. But on the fourth floor of a MITRE building in McLean, Va., aviation industry and federal government representatives get the next best thing: a way to see how new technology performs without calling air traffic to a halt. The same facility is also helping multiple agencies work out the details for integrating unmanned aircraft systems into civil airspace. Welcome to the MITRE Aviation IDEA Lab. IDEA stands for "Integrated Demonstration and Experimentation for Aeronautics," and it's the latest capability in the company's effort to help the FAA manage the nation's ever-growing air traffic load. In the versatile IDEA space, workstations can be arranged one day to make experimenters feel like they're in air traffic controller areas. The next day, if government officials need to see how a change in the control tower might affect airport airspace operations, that same space can "become" a terminal control station. All it takes is a few switches of equipment and some reconfiguration of the software. "There really is no better way to get the operational community to accept fundamental changes than to actually try them out," says Tony Chambliss, a program manager in the Center for Advanced Aviation System Development (CAASD), the federally funded research and development center MITRE operates for the Federal Aviation Administration. "We have an environment that makes it easier to get people to come in and get immersed in their roles, as opposed to feeling like they're in a lab." MITRE's Air Traffic Management Lab, which opened in 2001 and was the forerunner to the IDEA facility, had much of the same equipment and ran a number of experiments designed to make flying better and safer. But the IDEA Lab has a tower simulator, which the old facility didn't have, as well as two new cockpit simulators. It can simulate a wider range of air transportation functions. And it can do so in a single facility that allows those who will implement the Next Generation Air Transportation System (NextGen) to see how changing certain parts of the system will affect the whole. "The National Airspace System is continually evolving, and we have to evolve with it," says Chris DeSenti, an associate program manager. "Actually, we should be evolving ahead of it." Surface Trajectory Based OperationsA proposed set of tower automation capabilities to support ground and local controller activities, including automated decision support tools to generate taxi routes and help pilots follow their assigned routes. How the IDEA Lab helped: Lab researchers found the tools they tested improved ground controllers' accuracy in detecting issues not related to critical safety concerns. They also improved airport efficiency and reduced the need for communications between controllers and pilots. 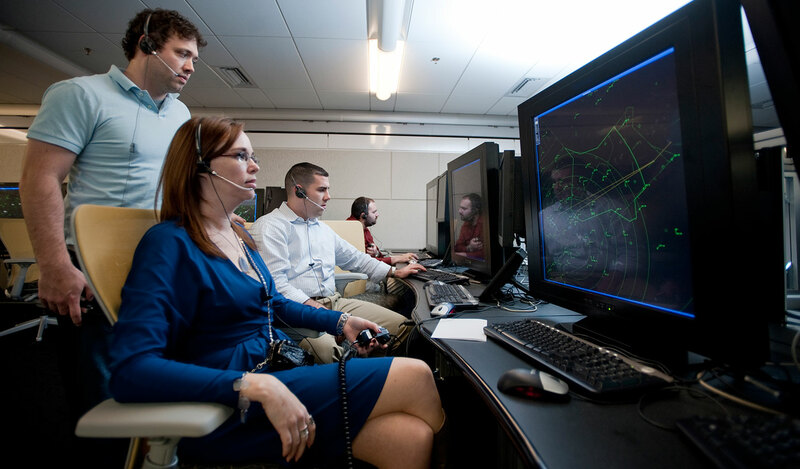 Advanced Technologies for Terminal Controller TrainingThis research automates training for air traffic control students, which currently takes place mainly through a combination of classroom instruction, simulation, and on-the-job training. The IDEA Lab research used real-time performance assessment, feedback, and voice-recognition for the specialized terms pilots and controllers use when talking to each other. The researchers also explored the development and integration of skill building "games." How the IDEA Lab helped: The terminal training work provided a set of capabilities that were transitioned to the FAA, which will determine which of those capabilities to implement and set specifications for contractors to follow. Runway Status Lights Runway Status Lights is the name of a fully automatic advisory system that let pilots know of potential hazards on runways and assess whether it's safe to take off or land. One part of the system, called Takeoff Hold Lights, go on when an aircraft is on the runway but can't take off safely due to traffic movement elsewhere on the runway. An IDEA Lab experiment explored whether locating Takeoff Hold Lights near other lights anywhere on the runway confuses pilots. How the IDEA Lab helped: The experiment showed pilots were confused when attempting to understand runway status with the use of multiple lighting configurations. Ongoing work will explore potential ways to reduce this confusion. Staying ahead of the curve has become even more important since the advent of NextGen, which is the FAA's plan to modernize the NAS to better handle continuing growth in air traffic while keeping the planes flying safely and on time. NextGen rests largely on replacing older, ground-based technology with newer, satellite-based systems. The need for more testing of the technology and associated new procedures (and tying them all together so they will work as one integrated system) drove the upgrade that led to the IDEA Lab. "The demand for experiments and demonstrations was increasing, and we noted that we were not using the existing lab space as effectively as we could," says Urmila Hiremath, director of NextGen Integration. "We wanted to provide software designers and engineers with an atmosphere that's more conducive to designing new systems and procedures. We also wanted to create more of a real-world experience for controllers and pilots participating in these evaluations." Demand for MITRE's aviation lab capability keeps growing. In fiscal year 2010, there were 312 events (defined as a combination of all activities, including demonstrations, tours, experiments, and evaluations). For 2011, there were approximately 530 events. The list of visitors to the lab spans a wide range of interest groups across government and industry, including Dave Barger, chief executive officer of JetBlue Airlines, and numerous representatives of the FAA, the Defense Department, and the National Transportation Safety Board, among others. All those officials will have a role in implementing NextGen. NextGen will give pilots more awareness of congestion or hazards at various stages of a flight. Perhaps more important, these changes may give pilots some of the authority to respond to situations that, until now, have been handled by air traffic controllers. This raises complicated issues that aviation authorities must consider in the safety context. As Chambliss puts it, "If you're coming in for a landing, that isn't necessarily the best time to have the pilot looking down at a display panel." The only way to resolve that dilemma is to produce what the IDEA Lab is good at finding: objective data. "Subject matter experts often come into the room with opinionseven before we've told them what it is we want to run through," says DeSenti. "We're able to take those opinions and stand them up to real-world performance data. We can take their subjective views and add objective data to help with decision-making and moving things forward." "They Have to Sit Together"
The IDEA Lab's ability to deliver such data hasn't been lost on those who have used it for experiments. Air Force Captain Josh Finch was on hand when the lab hosted a "ground-based sense-and-avoid" experiment. The purpose of this experiment, which incorporated many MITRE-developed concepts, is the seamless integration of unmanned aircraft systems (UAS) in the NAS while avoiding collisions with other aircraft. For the experiment, representatives of several groupsfrom the military and civilian sectorsran through several possible scenarios. Operational personnel from agencies who would manage the UAS played key roles, and other agency representatives observed. "I think that we had audio, video, even post-scenario surveys everywhere," says Finch, who pilots a Predator, a UAS used primarily for reconnaissance and forward observation. "There's a lot of data and evidence to back-up what we've done and a lot of data points to show what was effective and what wasn't." Of course, the FAA uses an array of data before deciding what technology it will invest in. But MITRE's ability to bring together those who will implement NextGenand give them objective data on which to base their choicesis helping demonstrate what change might look like from takeoff to landing. "When we bring all these industry and government representatives together, they have to sit together," says Maureen Tucker, a MITRE associate program manager. "They have to work through concepts together. They have to argue. And they're more likely to come out with a good capability."